HOYTS Chadstone is now open, setting the pace in the next chapter of entertainment! There are brand new concepts such as Eat Street, featuring Chur Burger, Artie’s Bar & Café and Treat City, along with crowd favourites including HOYTS LUX, powered recliner seats in every auditorium, 3D cinemas and Xtremescreen unleashing the biggest screen and best sound in the complex. 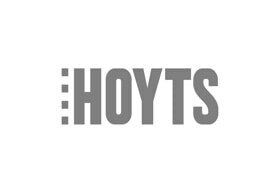 TRY HOYTS EAT STREET AREA!! Ben & Jerry’s with over twenty different flavours with a variety of toppings, sundaes, shakes, chillers, and more for ice cream lovers to indulge! Arties Bar & Café, affectionately named after HOYTS’ founder Dr Arthur Russell will be a Parisian inspired café by day, and a bar by night where guests will be able to have a morning coffee or a late night beer. Drinks can be enjoyed in the garden inspired terrace or carried into the cinema to relax, watch, drink and enjoy. Chur Burger has been hailed as the best burger in the Good Food section of the Sydney Morning Herald only six weeks after opening. Head Chef of Chur Burger, Warren Turnbull said “Our burgers utilise the freshest and most delicious ingredients and we welcome burger lovers all over Melbourne to come and enjoy in the Eat Street store. Chur Burger is becoming a favourite all around Australia with Chadstone as the only Melbourne location.